Leftists upset that President Donald Trump will get to shape the Supreme Court in a conservative direction are increasingly embracing a radical plan to expand the number of seats on the court once Democrats retake Congress and the White House. Liberal justices Ruth Bader Ginsburg and Stephen Breyer are 85 and 79-years-old, respectively, so it’s not unforeseeable that Trump could get to fill two more seats before he leaves the White House, potentially guaranteeing a conservative majority on the court for decades to come. Now some liberals argue Democrats should simply expand the number of court seats — and then immediately fill the new ones with left-wing jurists — as soon as they take back control of Congress and the White House. The Constitution doesn’t require a set number of seats on the court and leaves that power to Congress, which hasn’t altered the size of the Supreme Court since last setting it at nine in 1869. 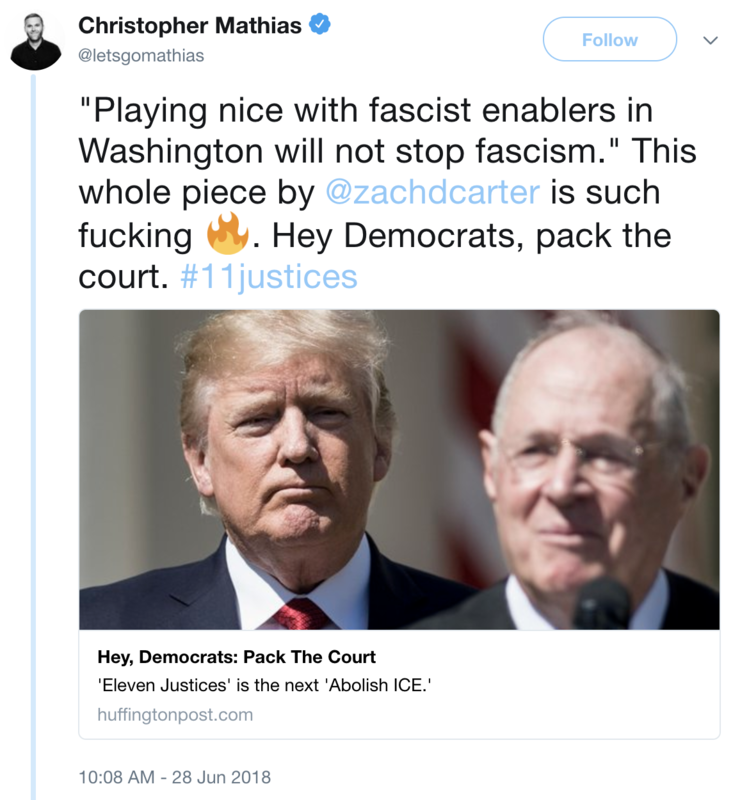 “Democrats have no choice but to implement structural reforms to the judiciary if they hope to prevent decades of rule by the alt-right in America,” HuffPost reporter Zach Carter claimed in a Thursday article. Jacobin writer Todd Tucker made a similar argument in an essay on Friday, claiming that Democrats need to rig the court in order to pass far left legislation that might otherwise be ruled unconstitutional. “A thoughtful court-packing proposal would ensure that the Court more carefully reflects the mores of the time, rather than shackling democracy to the weight of the past,” he added. 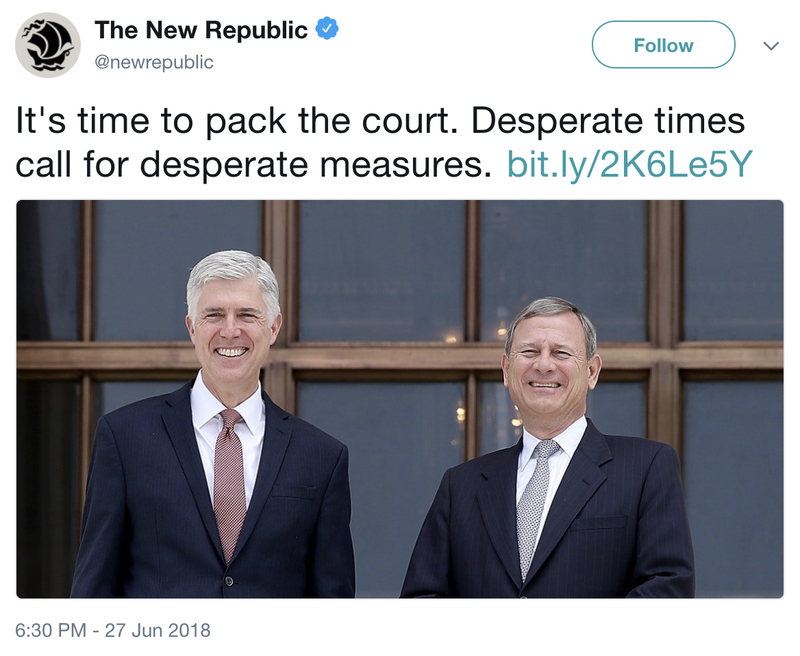 Even before Kennedy’s retirement, left-wing writers were laying the groundwork for Democrats to pack the court once Trump is out of office. New Republic writer Scott Lemieux argued in May that Democrats should consider packing the court if conservative justices keep Democrats from pushing a hard left legislative agenda. The left-wing magazine on Thursday tweeted out Lemieux’s article in response to Kennedy’s retirement. “Packing the court (or raising the number of justices) will become a question in Dem primary debates,” CNN analyst Harry Enten predicted following news of Kennedy’s retirement. Bloomberg reporter Steven Dennis reached a similar conclusion. “Don’t be surprised next time Democrats have control of Congress and [the White House] if they consider changing the number of seats on SCOTUS,” he wrote.